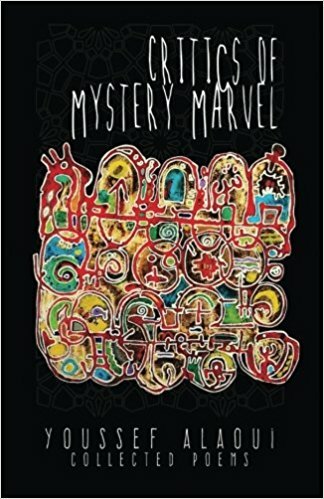 Youssef Alaoui: Critics Of Mystery Marvel is now available! Critics Of Mystery Marvel is now available! CRITICS OF MYSTERY MARVEL is Youssef Alaoui’s debut full length poetry collection, which explores human relationships between individuals, cultures, races, and genders. Alaoui deftly utilizes archaic tones to fo ) rmulate an artistic approach to metaphor in verse creating images that appear wholly in the mind and not on the page. This volume consists of ten sections that explores Alaoui’s family and heritage, an endless source of inspiration for his varied, dark, spiritual and carnal writings, blending surrealism, magical realism, and language alchemy as he explores the human mythos of love, gender, poverty, politics, racism, and war. A few of the poems are written in French and Spanish, translated to English. Post-beat verse from the San Francisco Bay area and the Big Sur, CRITICS OF MYSTERY MARVEL touches the depth of the soul with poetry that is metaphorically luminous. Youssef Alaoui's poems in "Critics of Mystery Marvel" are the exoskeletons of bullets, of bombs. Be careful, but proceed anyway. The barrage is not for harm, but for diversion: It is hiding a deep pool where lightning gathers in a broken heart, where silver shards of memory rise painful, but sweet in this poet s voice. "If only my five fingers were dynamite/for when I touched you I discovered/ your heart is a dark and gorgeous mountain... If we meet again/ and if I should hold you /this mountain will shudder and crumble." The Maghrebi artist is naturally surreal, as Algerian poet Habib Tengour says, and thus also "always elsewhere. And that is where he fulfills himself." As Youssef Alaoui does here, creating a poetry that uses his surrealist Maghrebi gaze to poke holes & illuminate the basic American Reel & vice-versa. Fez shimmers in the Bay Area, and the Bay Area is a Fazi s Fata Morgana. But you can touch it all, because it lives in the solid everyday real of these poems. I have been following this wonderful poet-magician for a long time and have always admired how he continues to cross boundaries. In this new collection we re taken on a tour of a complex and delightful mind.